Last month, Virtual Speech Center released a new app called Syntax Workout. 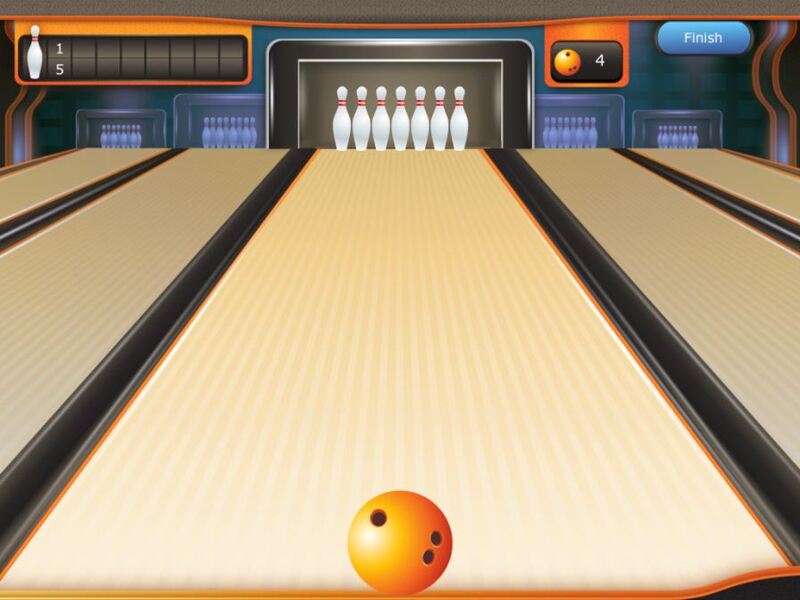 This is an app that focuses on syntax skills and has a fun bowling theme that engages students. My students LOVED the reward of the bowling games at the end of their trials of skills. When you first open this app, you select a student. You may select more than one student if you are working in a group. I'm not sure how many students can work at once, but I was able to put in six student names for one session. I don't think I would ever work with that many at once on an app, but Syntax Workout would keep data for all of my students if I did! 3rd person singuar vs. plural, is/are, was/were, do/does, has/have, subjective pronouns he/she, subjective pronouns he/she vs. it, subjective pronouns he/she vs. we/they, subjective pronouns- mixed, objective pronouns me/you, objective pronouns him/her, objective pronouns him/her vs. them. Students will then be shown a picture with two choices. The narrator reads a sentence and leaves a pause for the student to fill in a word. The narrator then reads the choices as each button is highlighted. The student has a choice of two answers to press. After the student selects their answer, there is an opportunity to record the sentence. After a specified number of trials (I chose 5), students get a reward of a bowling game. My students loved this part of the app! You can change the number of trials needed to get the reward game in Settings. When your student is done with their session, you can get a report card. The report card stores data from all sessions. You can access the data by activity or by date. These report cards can be emailed. What did I like about Syntax Workout? I loved the fact that there are 1500 different stimulus pictures/ targets in this app. I know that my students will not get bored right away by using the same pictures all of the time. Also, the use of real photographs is always a bonus. My students really loved the reward game of bowling! What would make Syntax Workout even better? I like that you can record sentences, but I wish that you could save a few in the data section for each student. Another thing I noticed is, if you are working on two different targets, it does not mix up targets. Rather, the student needs to go through all trials before moving on to a different skill. I think this app is great. I will be able to target a lot of different syntax goals with these activities. You can find Syntax Workout HERE. It is currently available on iTunes for $16.99. *I was provided a copy of the app by Virtual Speech Center for this review. I was not compensated in any other way for this review. There are many workout app that are very useful for those that are not so fit.